Korean Air has postponed its B747-8 service between Seoul Incheon and London Heathrow by one month. The national carrier had planned to roster the aircraft on to the route on August 2 (see news, March 4) but will now do so on September 2. The B747-8, which features Korean Air’s new business class and will replace the incumbent B777-300ER, will initially operate the route three-times weekly, on Wednesdays, Fridays and Sundays. Outbound service KE907 departs Seoul at 1300 and arrives in London at 1725, while return service KE908 leaves London at 1935 and lands in Seoul at 1425 the next day. From September 30, the aircraft will fly to LHR on a daily basis, reports airlineroute.net. The B747-8 will be configured in three classes with six seats in first class, 48 in Prestige (business), and 314 in economy. The entire upper deck houses 22 business seats in a 2-2 layout, with the remaining 26 seats on the main deck in a 2-2-2 configuration. 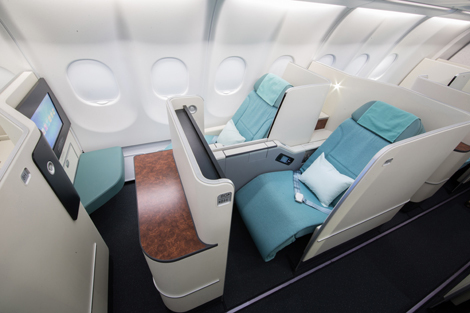 Korean Air introduced the new Prestige Suite cabin seat, which it will debut on an A330-300 currently serving flights to Guangzhou, Singapore and Hanoi, last month (see news, February 4).